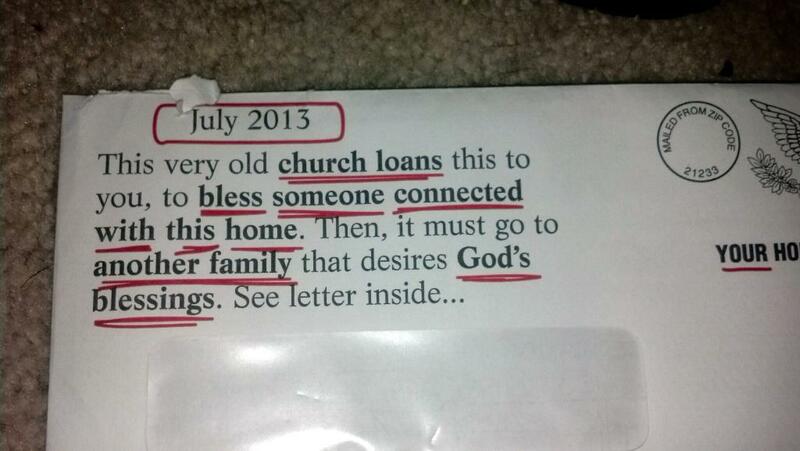 Last week, I received a letter in the mail. Someone had underlined a bunch of words with red, specifically so I would notice this letter. At first I thought that I had run afoul of a bill collector, and the red ink was indicative of how irritated they were with me, but then I actually read the envelope. Not what I was expecting, but okay. I opened the letter. I read the letter. I read the letter again. The gist was that I was supposed to take a helpfully provided picture of Jesus and place it where I thought I needed the most help. (In an effort to be compliant, I placed the picture directly over the dishes in my sink. They needed more help than I did.) After a short period of time, I was supposed to take the picture of Jesus and mail it back to the church along with a short checklist, so they could pray for me. An envelope was helpfully provided for me. 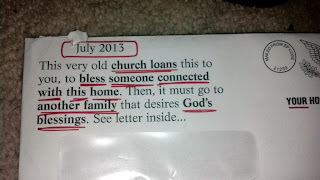 As I sat there and stared at this letter, with the envelopes and picture of Jesus, I was struck by how very similar this all was to the old time chain letters we used to get in the mail. Although they did not specifically ask for money, there was a distinct "chain letter" flavor to the entire enterprise. But how could I be so cynical? I felt guilty that these kind people sought me out specifically to pray for me, all out of the goodness of their hearts. And then I saw the exact same letter sitting on the table at my mom's house. So much for that! Zane has a diet plan. He made it up all by himself, and I have no idea why or where. But he told his father that Larry could have whatever he wanted, but only 20 bites. 20 bites is plenty, Zane says. He wasn't specific as to the size of the bites, only the number. The kid may be onto something--the pundits are always talking about portion size. Surely 20 bites is smaller than what most of us eat. Maybe knowing that we only had 20 bites would cause us to savor those bites, chewing slowly and thoughtfully? I've been using my Kindle Fire to watch old episodes of Ren and Stimpy. That show came on during my college years and was required viewing. I loved Stimpy--such a good hearted cat! Ren, the chihuahua, was not so nice, but it was obvious that he loved Stimpy. Looking at it now, I can say that the show is outright weird, but it works. We got some rain yesterday, with more on the way this week. For once, our entire household has been rejoicing. As a summer project, my husband has been working on the fields where my son will be playing soccer, trying to get them ready for the fall. So far he's installed a watering system and thrown down a ton of dirt and mulch and seed. Larry has also found sponsors to donate some of the supplies, which no one else thought to do. A few people have been out there helping, but Larry's done a great deal of work by himself, just to make sure that it gets finished. When everything is done, there will be three full-sized soccer fields all greened up and ready for play. I am very proud of him. So many 'volunteers' these days do more standing around than actual work, so I feel the need to be extra thankful for the ones who are actually busting their butts to be helpful. Like my friend Andrea over at Maybe It's Just Me--she helps out others by cooking meals for Meals on Wheels. And I'll bet she never sneaks off with any of the cookies! Now that I've got my new job, I'm finishing up the old one, and as part of that, I have to clear out my desk. I'm dreading that part; it's been a long time since I've gone through my desk. I might find odd treasures, like Jimmy Hoffa, but more likely I'll find junk that I should have tossed out a long time ago. Maybe I'll just pull out drawers and toss the contents into the trash can. That seems to be the most efficient course of action. Maybe there's other parts of my life where that might apply? We are heading for SeaWorld to check out the critters. Hopefully Shamu is in an entertaining mood. I'm still debating whether or not to just wear my swimsuit, because odds are good that we are going to be sitting in at least one splash zone. This will be Zane's first visit to SeaWorld, and I look forward to seeing what he thinks of all this. That right there will be worth the cost of admission. I hope everyone has a great day! 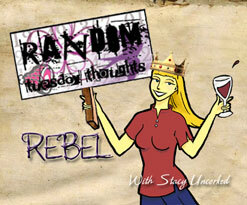 Go visit Stacy, she's uncorked today! I've been cleaning out my drawers too since I am going on leave and want it to be clean in my office; it's kind of crazy how quickly we accumulate things! Also, Ren and Stimpy! Love that show! Though, now I feel old because that was new when I was in... middle school.